Recently it surfaced that our dear family pals have a fond place in their hearts for the restaurant Chili’s. Upon hearing this, I, of course, very much wanted to go to Chili’s with them (although my normal desire for Chili’s hovers around zero). It’s sort of like when there’s a hobby you don’t understand, but it means something to your loved one so you enjoy doing it with them. That’s going to be me & Dave tonight at Chili’s with this family. And we are thrilled. 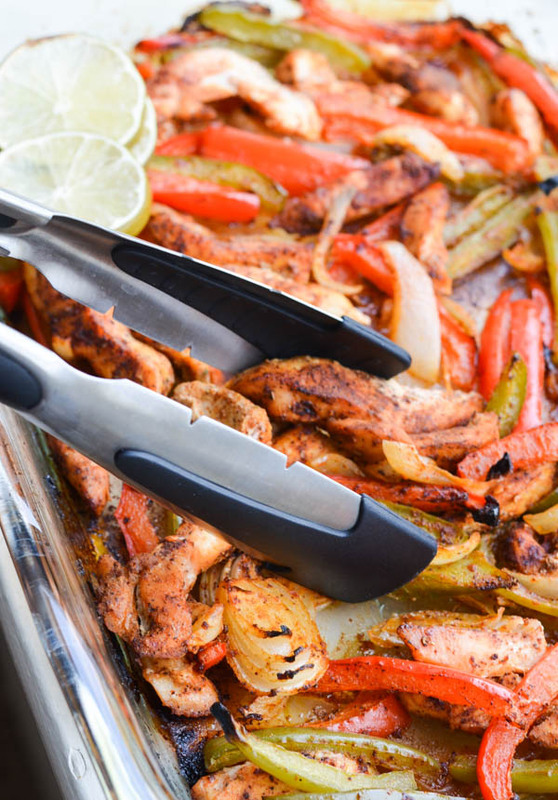 Should you not be as privileged for a fine Chili’s supper with your homies, you could have these fajitas in your own kitchen. Preheat oven to 400 degrees. 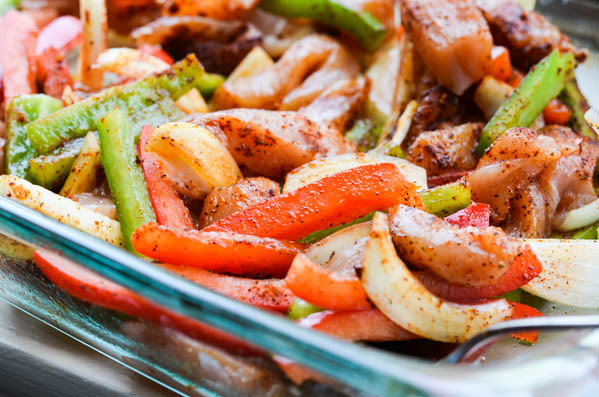 Place onion, peppers, and chicken in 9×13 glass baking dish. Drizzle and coat with olive oil. Sprinkle taco seasoning over dish and toss to coat. Roast in the oven for 25-35 minutes, stirring once halfway. Top with lime juice. Place onion, peppers, and chicken in 9x13 glass baking dish. Drizzle and coat with olive oil. Sprinkle taco seasoning over dish and toss to coat. Roast in the oven for 25-35 minutes, stirring once halfway. Have been making this recipe for a while and it’s always a winner. 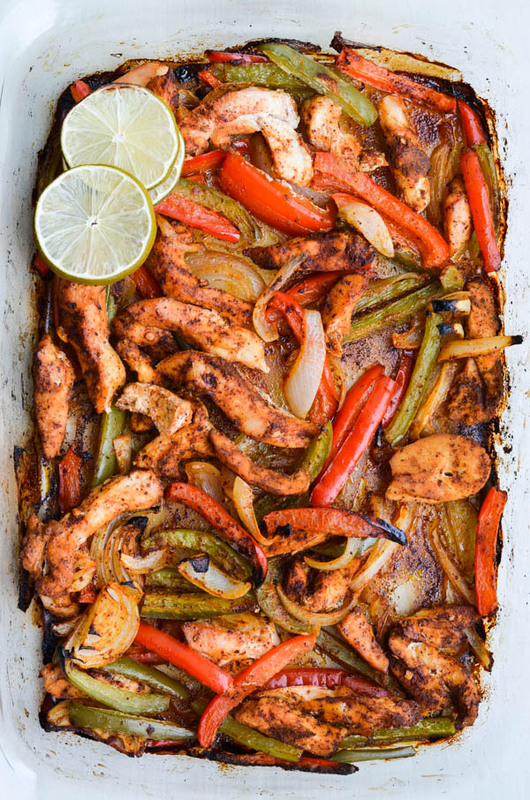 Any way to get nutritional info on this recipe for Oven Roasted Fajitas? That’s lovely! Thank you Charity! thank you for breaking this down so I don’t have to go there either! Just not my preference, but nice recipe! 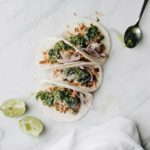 This was linked in a recent post (March) on foodie crush, so glad I found it! This is one of my favorite recipes. I always hated how mushy peppers would get in a frying pan. Now my veggies are nice and crisp!! I also throw it under the broiler for a couple of minutes to get the top charred!! YUM!!! Hi! is there any way i can make the portion smaller? These are great. They’ve become a regular for us. I love the suggested taco seasoning, and it’s become what we use for all Mexican dishes instead of having to resort to the envelope. Thank you for the great recipe! 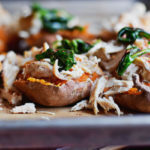 My favorite recipes are those that are easy, quick, and healthy… this one has all 3! I slice the chicken and veggies ahead of time and it takes no time at all to pop into the oven after a long day of work. I usually serve with rice & avocado. Could you do this with steak as well? I’ve done it with chicken several times and it always tens out amazing. I was just wondering how it would be with steaks. Also, if you have done steak, what type would you suggest? When you put the chicken and veggies in the oven, do you cover them? I would like to print off this recipe. So, I hit “print”. Does anyone else not get any response to print request like I did? PS. This really looks delish!! Looks good and will try, but print function not responding. In the photo it looks like you lined the pan with parchment paper. I’d definitely do that to make clean-up a snap. it’s wonderfull, i’ll try it. tk. Love this recipe – has become a family favorite! I do make it in a dark non stick sheet pan as I think it makes a nicer coating on the chicken and veggies – similair to what you should get in a restaurant. Made these tonight – they are so good, I even made your taco seasoning. Thank you for sharing! recipe? Looks awesome can’t wait!!! Just wanted to say thanks for this great recipe!! Totally awesome recipe. My daughter made them for us during a recent visit and now this is what my husband wants for his birthday dinner. This is a great easy and fast recipe. Add salsa, avacado and cheese. 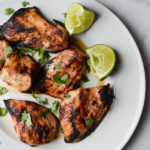 Serve with lime rice and beans. Thinking about doing a party with a tray of chicken, one of skirt lsteak and one of shrimp. Different salsas and toppings. Yum! This was fantastic! We served with black olives, cheddar cheese abd sour cream. 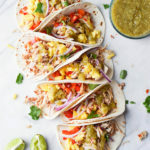 Such an easy and flavorful recipe! Thank you so much for sharing! It is definitely a keeper and repeater:-) Everything was cooked through in 35 minutes. This was absolutely delicious! And as a college student I also found the ingredients for this recipe to be very affordable. My roommate and I loved this and I will definitely make it again! 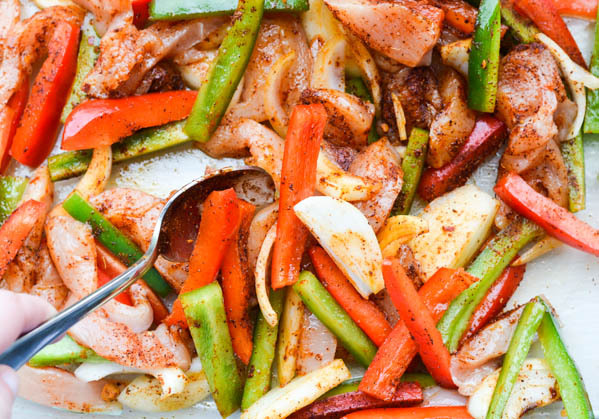 Do you put the sliced chicken in raw with the veggies? Wouldn’t the veg be done in a quicker time, thus leaving the chicken undercooked? I’m thinking I might sear the chicken slices first just to be sure. Thanks for your help!! I used raw chicken and it turned out as pictured. new to your blog — we made this last night and it was awesome! 3 kids, job and not alot of time to cook. this is a keeper! Hi Rachel, my family and I loved this meal. It was so easy to put together and so very tasty with salsa and guacamole. Thanks for the great recipe! I made this recipe yesterday (previously made your taco seasoning recipe) and modified it by adding 8 oz. of sliced mushrooms. It was delicious and so wonderful to make a meal in one casserole dish.